This article discusses a particular type of bullying on Twitter — an anonymous form where people attack someone because of their political beliefs but have no other connection to the victim. Situations where the attackers know the victim are completely different. What is this, who are these people, why are they mad at you, and what should you do about it? First, relax. This is a unique form of bullying on Twitter, where people find a tweet of yours and pile onto it to express their viewpoints. No matter how personal the message they send, it’s not about you. It’s a firestorm that comes at you and, in a few days, moves on to its next victim. No matter what you do — or what you did — they’re just coming by to tell you how much smarter they are. They’re not going to keep coming back after you again and again. Pros: You stand up for yourself. You defend yourself. You heap the same scorn on them they try to heap on you. You get some satisfaction. Cons: You will not get them to admit they’re wrong, or apologize, nor will you get the last word in. They will always reply to you, they will always want to get the last little bit of ridicule in. There is no truly satisfying win to be had. There is no dishonor in either choice. It is entirely a personal preference, and you can switch as your enthusiasm waxes and wanes. If you’re going to fight back, I would be definitive and final with one tweet: Tell them their advice is not welcome, you have no interest in their thoughts, and you have total contempt for them for their actions. (True, getting that into 140 characters is very hard!). 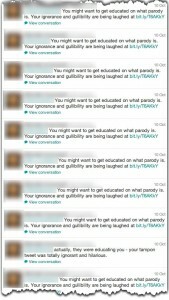 When they reply (and they will, because they always have to get the last word in), block them and report them for spam. They’ll whine that you’ve done that (not that you’ll see them anymore! ), but remember that you’re the one in control at that point and there is no appeal from your decision. You own the switch, flip it when you will. Pros: If you’re not proud of what you wrote, deleting it stops your further embarrassment. 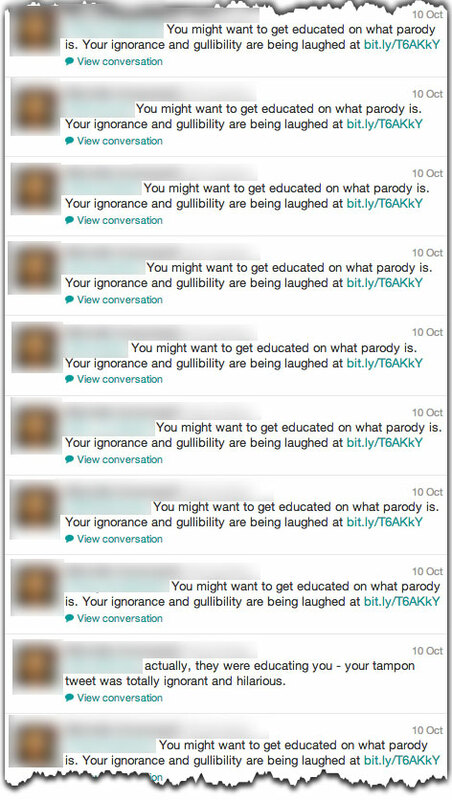 It’s also harder for people to tweet to you because they cannot reply to the message they objected to. That will discourage many of them from coming after you; in a small survey, people who did not delete their original tweet received 30% more hate tweets. Con: You said it. Even if it’s not the best tweet, it’s a free country and you have a right to say it. You can always clarify what you meant or correct it in another tweet without letting the bullies chase you offline. And, even if you delete the tweet, other people may still have saved copies of it and still list it on their web sites where they can sneer at it and you. You may end up getting harassment for both your original tweet and for deleting it. Personally, I only delete tweets when I’ve made a serious mistake (or, very quickly if I realize I’ve made a typo). Otherwise, if they don’t like what I have to say, they shouldn’t read it! Should you block everyone who sends you nasty tweets? In general, I would say yes: block them and to report them for spam. It’s an unsolicited, unwelcomed contact. (Note that if you feel threatened by their message, there is a separate process for reporting that. You should take advantage of it). Should you lock your account so that it is private and visibile only to your followers? That really just depends upon how bothered you and your friends are by the nasty messages. If you get over about 10 nasty tweets, I would seriously consider it unless you’re really enjoying toying with the wackos. What else can you do? If you’re truly brave, retweet some of the insults so the whole word can see it. (I learned that from Touré.) If you reply to them, always make sure you put a period before their @username so it is visible to everybody who follows you (if you don’t it will not be seen by most people, and they’ll miss your witty responses!). Oh, and the person who claims to be from law enforcement or connected with law enforcement and says they will be coming after you: they’re not and they won’t.